Emily: There have been several other lists I’ve seen that each have a different group of designers in mind or that had a different focus. 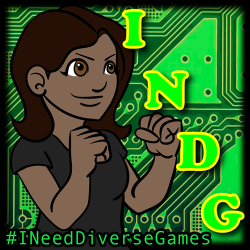 #DiversifyStreaming2K15 lists POC streamers. John H. Kim has a list of women game designers. RPGGeek has a list of women game designers. Wikipedia has a list of women role playing game professionals. There is one devoted to black (digital, I think) game developers that is short, sweet, and to the point. I heard about that from Tanya!